Now that music's out there in the cloud, rather than over there on your shelf, it's harder than ever to decide what you feel like hearing. Now that we have unlimited supply behind a tiny display window, we are more reliant than ever on the names that our memory just happens to shuffle to the front of mind. I wouldn't describe Steely Dan as my favourite band but they are the act whose music I reach for – or maybe that should be click for – more than any other. The sound of the records they made in the 1970s doesn't date. They have a pop catchiness that falls just short of being ingratiating. It helps that their singles weren't big hits so they're passed over by the algorithms responsible for programming most radio. The performances are detached enough to match whatever mood I happen to be in. None of their songs seem conspicuously happy or sad. They're all just faintly amused. And since they kept their own pictures off their covers, giving them over instead to cryptic illustrations and curious archive photographs, there's no personality to get in the way. They're the band that fills the time when I don't know what I want to hear, the band I can eat between meals without spoiling my appetite. Finally caught them 'live' in Glasgow circa 2001. Apart from being brilliant to the point of genius, they are also the only band I've ever seen that gave their backing singers a song to themselves (Dirty Work - the girls took a verse each) which was unbelievably generous and completely devoid of ego. I loved them a little bit more for that. All of Steely Dan's, Donald Fagen's and Walter Becker's* albums are the only music I have stored on my PC and three 'devices'. For some reason I'm always a titchy bit scared of losing them in a way I'm not about anything else I've got. It's not even as if I often listen to music,with those tiddly little ear plug things; I can't stand the sound being so close to my ears. My uncle Dave used to listen to Tubular Bells with headphones that looked like he had a pair of ebony hovercrafts stuck to his lugs. Anyway, when I have to fly, or take a train anywhere, I know that at some point there will come a spell when only The Dan will do. And, as icing on the cake, the intros of Steely Dan songs make exceedingly good ringtones. I can also recommend Fagen's part memoir, part diary, Eminent Hipsters. Can I suggest that Andy Brim write all liner notes for any forthcoming Dan retrospectives? There is a photo on the “backside” of the cover of “Countdown To Ecstasy”. It’s the “original” quintet; David Palmer had recently departed. The disembodied hand belongs to engineer Roger Nichols, apparently. Been a fan ever since I heard “Do It Again” on the wireless back when dinosaurs walked the planet. Contrary as ever, “Aja” and “Gaucho” are my least favourites from the original album releases. “Can’t Buy A Thrill,” my favourite. They actually sound like a working band here. Somewhere, hopefully safe and snug I have a copy of the 1977 12” EP, featuring “Dallas” and “Sail The Waterway” as the lead tracks with “Do It Again” and “Haitian Divorce” as guests. I enjoyed “Eminent Hipsters,” likewise Brian Sweet’s book about the band, although more than several didn’t. Always been a fan since about '74, much to my wife's despair. My enthusiasm survived punk/new wave and all other musical fashions since. 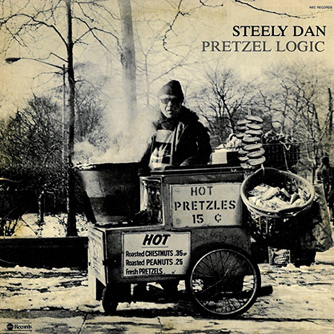 Pretzel Logic/Royal Scam are the standouts for me. Saw the Dan (well Becker & Fagen plus backing band) at Hammersmith Apollo in 2007 (Aja 30th anniversary), It was a superb night, Aja was immaculately played and the whole audience stood and sang the encore of "My Old School". Having said that, I never really warmed to the more recent efforts, ("Two Against Nature" etc. ), but the first seven were great. Love them but took me a while to really understand why. They do divide the sexes though, very much a blokes band. Completely agree with DH; even if I'd never previously analysed the reasons, those early albums are the go-to background when I've got some work/writing to do that's neither difficult enough to require monastic silence nor so brainless that I can bellow along to anything while my fingers work on autopilot. I say "those early albums" because I also agree with Rod Ethtie. To me, the first three albums sound like collections of very good songs – from a number of playfully yet respectfully represented genres; thereafter, there seems to be a dangerous slide into chin-scratching ego-stroking Jazz Odyssey. Indeed, I tried Aja too early and it nearly put me off altogether. Which is not to disrespect the opinions of others; just how the band affects me. They inspired more rock trivia intrigue than any band. What was a roulade? Was that really a katydid on the cover of Katy Lied? cry a jag??? Pure cheek got me the Steely Dan T-shirt(black, grey felt lettering) in May 74(rang their UK label up and claimed it was for one of the guitarists in Wishbone Ash) and two front row upper circle Rainbow tickets in 1974. I was in Fopp in Covent Garden a few months ago. The staff put on Aja and within two songs they had sold the copy they were playing to a customer. Can't stand them and have never understood how anyone can. Sorry to poop on the party! I'm always surprised by the types of people that like Steely Dan (young, old, hip, hep, hip-hop, etc.). They're a band that, like John Martyn, I find myself always coming back to. They are also dry, witty and on form in the Classic Albums on 'Aja' and thanks to the previous posts I am now downloading a copy of the audiobook version of 'Eminent Hipsters' narrated by Donald Fagen himself (thank you Andy Brim). Ian Dury on the classic albums dvd about the making of Aja: "They've just got a sound that lifts your heart up. It's the most consistently upfull [Duryism], heartwarming...it's a record that sends my spirits up and when I listen to music that's really what I want. I don't really want to hear people moaning and I don't want to hear music that moans."